Japan. Lords across the nation vie for control of three precious commodities: the loyalty of lesser lords, the land's primary sources of rice, and the very religion of the people. Throughout it all, there is one constant: the samurai. The year is 1336. The emperor's attempt at regaining power through the Kenmu Restoration has failed. The royal family has lost all authority and has been relegated to nothing more than figureheads. The Ashikaga shogunate now holds power over Japan, but it is a tenuous thread at best. Across the country, powerful lords called daimyo have risen up and begun to claim dominion over the land and its resources. As these lords grow in power they . draw samurai to their cause. While the samurai are the necessary force needed to gain control of Japan, there are other assets the lords must consider in their conquest. The Buddhist priests hold sway over nobles and commoners alike, contributing culture and legitimacy to any ruler holding their favor. Rice has been Japan's staple food stock for centuries; whoever controls it rules the population. Finally, a lord cannot hope to gain samurai to their cause without strategic military installations. No one daimyo has ever managed to unify the samurai and, with them, Japan. As the rival lords appear ready to challenge Ashikaga, their samurai followers flock to new lords. Something innovative must be done to succeed where so many others have failed. Some new creative strategy must be devised. 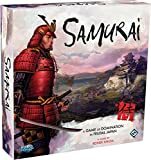 Part of the Knizia tile-laying trilogy, Samurai is set in medieval Japan. Players compete to gain the favor of three factions: samurai, peasants, and priests, which are represented by helmet, rice paddy, and Buddha tokens scattered about the board, which features the islands of Japan. The competition is waged through the use of hexagonal tiles, each of which help curry favor of one of the three factions - or all three at once! Players can make lightning-quick strikes with horseback ronin and ships or approach their conquests more methodically. As each token (helmets, rice paddies, and Buddhas) is surrounded, it is awarded to the player who has gained the most favor with the corresponding group. Gameplay continues until all the symbols of one type have been removed from the board or four tokens have been removed from play due to a tie for influence. 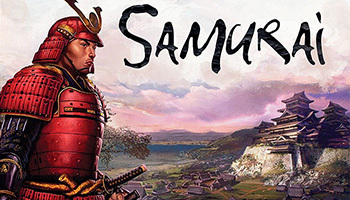 The game of Samurai allows you to take the role of a daimyo just beginning ascent to power. Travel back to a Japan being torn asunder by warring clans. Prove you have the wisdom to garner the esteem of the samurai and you will unite a nation. During a game of Samurai, players compete over the three societal castes of Japan: religion (represented by Buddha), commerce (represented by rice), and military (represented by a castle).